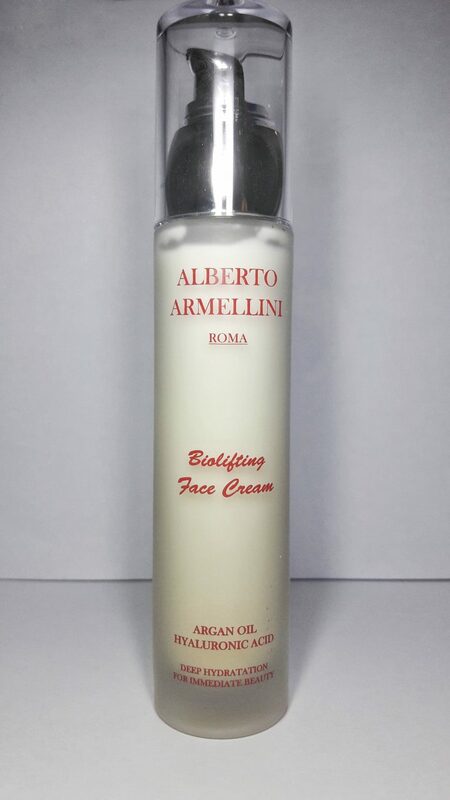 Biolifting Face Cream represents the foundation of the modern daily cosmetic care, conceived and designed to conserve or recover the natural beauty of the face, to maintain or re-establish the balanced hydration of the skin, enhancing the skin tone and its luminosity. The original formula, precious and unique, with a base of pure Argan Oil and hyalouronic acid of the highest quality, helps the skin to constantly maintain the natural parameters of health and youth, increases the hydration both on the surface and, mainly, in depth, develops a continuous regenerative action, favors collagen synthesis, increases the protective capacity, creates a natural shield to resist the action of free radicals and, therefore, to revolt against early skin ageing. Regular daily application will make the skin on the face, neck and bust never miss the quantity of water which is necessary to maintain its competency and plasticity. Besides, it activates the skin to limit at maximum the evaporative phenomena which tend to subtract the humidity to the epidermis, exposing it to the risk of wrinkle appearance, loss of tone and ripples. Massively hydrated, polished and tightened, day after day, the face skin will gain in freshness, tone and luminosity. It will appear smooth and silky to the touch, and, thanks to the constant action of stimuli, the signs of time will be progressively minimised and outstretched, from ageing wrinkles to the most recent and light ripples, from expression wrinkles to the first unsightly subsidences.